What were the rural roads in northern Thailand like twenty years ago? Vietnam ten years back? They were much like the roads on this trip through northern Laos. On a recent trip our group spent a couple of hours at the new Vietnamese immigration post, then exiting Vietnam and processing our visas on the Laos side of the border. During this time, nobody passed through the border area. That's how empty these roads are. 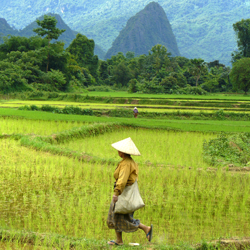 Come ride through picturesque karst scenery, punctuated by jungle laden national parks and rural villages in Southeast Asia's least populated countries. New roads make for a comfortable ride and newer guest houses are far from roughing it. Meals are served up with all the usual favorites, including spring rolls, noodle soup and curries. Another pleasant surprise is the tall, cold Beer Lao gets the nod over Angkor beer and Vietnam's selections of brews, who'd have figured? In ten years, you'll be able to say you went there when it was like this. A note on mileage. With multiple vehicles, our custom tours provide for any amount of cycling your group, or even particular people in your group, want to ride (or not ride). Mileage below is only a suggestion, shorter (and much longer) distances can be arranged, even during each day's ride, and off-bike activities planned to fill the time. Bia Hoi, or happy hour, is a post-work custom unique to Hanoi, with draft beer and snacks served up in street cafes. Other culinary treats? The best pho in the country is from Hanoi, don't miss a piping hot bowl (as your guide for the better places). This morning, we make a run for the border by bus on National Highway 15 through Pu Luong and and Pu Ha Nature preserves to beat the 11:00AM border closing (about 70 miles). 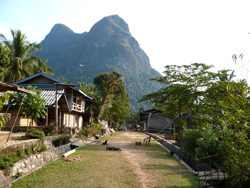 After crossing into Laos, obtaining visas and meeting up with crew, begin riding on national route 217 , cycling uphill towards Vieng Xai on paved roads under some of the most picturesque karst scenery in Laos, passing hilltribe villages in the area, including Thai Dam, Thai Dang, Meuy, and Kmu. Picnic lunch en route. 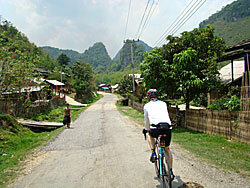 After lunch, continued riding to Vieng Xai. After arrival, freshen up before driving outside of the town to explore a nearby network of hundreds of caves. The caves, both natural and artificial, were developed and used by Pathet Lao in Vieng Xai during the Vietnam war, including Khayson Cave, the office and residence of the Pathet Lao chief during the war period, and Souphanouvong Cave, also called Red Prince Cave, the residence of royal Prince Souphanouvong at one time. Then, onto Nouhak Cave, named for Nouhak Phoumsavang, who served as Lao PDR president from 1992. Note: One passport-sized photo and US$35 cash required for Laos visa. After sunrise breakfast, departing for an epic day's journey over the "Laotian Alps" to Vieng Thong, cycling over the massive 4,000+ foot Phou Lao and Phou Leuy mountain passes, where we'll spy the 2,062 meter peak of Phou Leuy and 2,079 meter Phou Pan-Cnai in the distance. 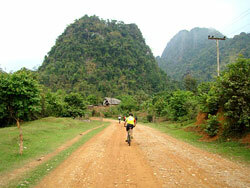 From Vieng Xai, we continue riding on national highway 6 to Nam Noen (64.5 miles and about 4,500 feet) of climbing. En route, pausing to explore Hing Tang (Suan Hin), a man-made formation of vertical stones that may be related to those on the Plain of Jars. At Nam Noen, we'll turn northwest (right) on route 1 towards Vien Thong, a hilly 36 miles way. After arrival in Vien Thong, walking to nearby hot springs to soak worn legs before exploring the small town set on the Nam Khan River and largely inhabited by a collection of hill tribes particularly Hmong and "lowland" Lao. Before dinner, we'll stroll to neaby hot springs to soak our legs. Overnight at simple guesthouse. 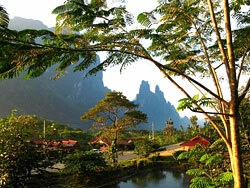 Nong Khiaw, it doesn't get much better than this anywhere Asia. Nestled between high stone peaks covered with lush green vegetation along a tranqil river, this small town is only recently being discovered. After cold beer Laos, curry and noodle dishes, our tired legs will be treated to traditional Lao massage. After breakfast, board longtail boat for one-hour cruise on the picturesque Nam Ou river, between jungled-covered karst peaks to Muang Ngoi. After arrival, refreshments before we begin our hike to several of the outlying, remote villages in the area. Muang Ngoi was controlled by the communist before 1975 and the province was under control of Pathet Lao. During Vietnam War, people in this area hid in the caves in the day times and worked at night because of continuous bombing. Light trekking to Tham Kang, where, according to local legend, a sacred Naga resides. 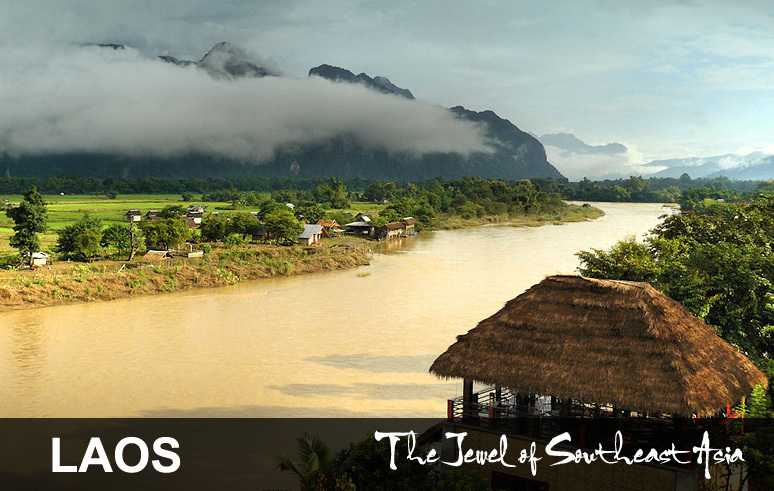 From Nong Khiaw to Luang Prabang is 140 kilometers and we'll ride from breakfast through some of the prettiest and flattest parts. After turning onto the main road to Luang Prabang, the road begins to roll and some may want to pack it in not long afterwards. Slacker option: roughly a 6-hour cruise to Luang Prabang by long tail boat. This section of river is very scenic as there are jagged limestone peaks lining either side of the river. Once we reach the Mekong River we would make a slight upstream detour to visit the amazing Pak Ou caves. This open cave is locate beside the river, is packed with hundreds of Buddha images and is an important place of worship for locals. If you choose to go by boat we can arrange it on the spot and the boat fee will be split amongst the passengers. After breakfast, day free or optional cycling outside of the city to passing through several villages and pausing to visit a local family and school as well as cottage industries in the area. Aftwrwards, return to town in time for lunch. 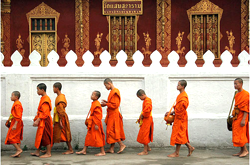 Rise at dawn to view the traditional alms procession by monks moving slowly through town. After, return to hotel for breakfast and then transfer by tuk-tuk to explore Luang Prabang's local Phuosi Market before beginning exploration of the town on foot. Pause to explore major temples dating to the 15th century such as Wat Xieng Thong — a masterpiece of Buddhist architecture — followed by the Royal Palaces and museum, and other French-colonial period buildings. Luang Prabang's night market is one of the best in Indochina for finding unique, handmade goods and at a bargain rate. The market makes a good stop after watching sunset from Mount Phousi. How much to bargain? Typically, counter with offer that is about 1/3 from the price quoted. Want to see where the locals shop, take a tuk-tuk out to Phuosi Market, about 1 kilometer from the central area. After breakfast farewells, transfer to airport for flight home or two-hour flight to Phnom Penh for our optional Cambodia extension. 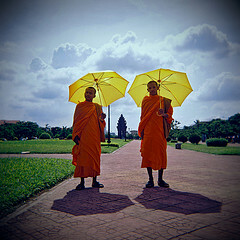 Note: Cambodia visa issued on arrival with one photo and US$25. Angkor is astounding and complex in scope. 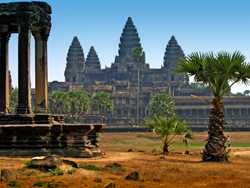 Early French explorers could not imagine the Khmer kings were responsible for such monumental work. The inspiration for Angkor architecture was born from a unique mix of Hinduism and Buddhism which drove Khmer monument construction for nearly three hundred years from the 9th to 12th centuries creating Angkorean structures that have no parallel. 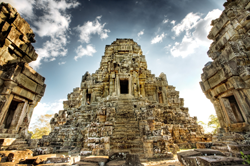 In the afternoon, visit the immense walled city Angkor Thom that was the masterpiece of King Jayavarman VII. Following the occupation of Angkor by the Chams from 1177 to 1181, the new king dictated the building of an impregnable fortress at the heart of his empire and the scale of their work is staggering, immediately overwhelming visitors upon arrival at the city’s gates. The causeway is lined by an intricate bridge depicting the Churning of the Ocean of Milk from Hindu mythology in which the devas (gods) and asuras (devils) play tug of war with a naga (seven-headed serpent) to “milk” the elixir of immortality. Afterward, visit to the Bayon Temple, a "temple mountain" situated in the center of the city of Angkor Thom. A three-tiered pyramid with a central shrine surrounded by dozens of towers all crowned by gigantic faces that represent the god Avalokite-shvara. Unlike his predecessors, worshipper of Hindu deities, king Jayavarman VII adopted Mahayana Buddhism as the fount of royal divinity and this sets The Bayon apart from many other Angkorean monuments with Hindu influences. After, visit at the Terrace of the Leper King. This intricately carved platform was the royal crematorium and the statue that was originally thought to be the leper king is now believed to be Yama, the god of death. Continue along the Terrace of Elephants, originally used as a viewing gallery for the king to preside over parades, performances and traditional sports. At the southern end lies the Baphuon, once of the most beautiful temples at Angkor, dating from the reign of Uditayavarman 1 in the 11th century. It has undergone a massive renovation by the French and is now once again open for viewing. 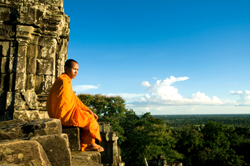 The climax of Angkor Thom is the enigmatic and enchanting temple of the Bayon. At the exact center of Angkor Thom, this is an eccentric expression of the creative genius and inflated ego of Cambodia’s most celebrated king. Its fifty four towers are each topped off with the four faces of Avalokiteshvara (Buddha of Compassion), which bear more than a passing resemblance to the king himself. The colossal heads stare down from every side, exuding power and control with a hint of compassion, just the mix required to keep a hold on such a vast empire. Before clambering upwards, unravel the mysteries of the bas-reliefs, with their intricate scenes of ancient battles against the Chams and their snapshot of daily life during the Angkor period. Rise before daybreak view Ta Prohm in the light of dawn. Ta Prohm has been abandoned to the elements, a reminder that while empires rise and fall, the riotous power of nature marches on, oblivious to the dramas of human history. Left as it was ‘discovered’ by French explorer Henri Mouhout in 1860, the tentacle-like silk cotton and fig tree roots here are slowly strangling the surviving stones creating a surrealistic juxtaposition. After soaking up the unique atmosphere of Ta Prohm, continue to the giant pyramid of Takeo, one of the tallest temples in the Angkor area. Built at the end of the 10th century, it was never completed. This morning also visit the remains of an old Angkorian bridge which once spanned the Siem Reap River. 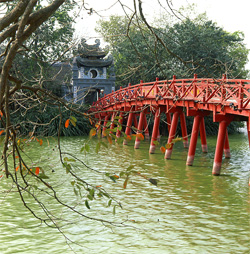 Time permitting, optional visit the smaller temples of Chau Sey Devada and Thommanon. In the afternoon, pause at the local village of Preah Dak before moving onto the 12th century temple Banteay Samre. Built by King Suryavarman II, the ruler behind Angkor Wat, this temple has been extensively restored. The temple is unique in that over-quarrying of sandstone led to the use of laterite for the roofed corridors. The pediments above the inner doors here include some of the most accomplished carving from the Angkor period. Depart Siem Reap to Bangkok for international flight.